Hawaii business leaders, members of the Japanese American community, Lt. Governor Brian Schatz and Japan Consul General Yoshihiko Kamo convened to organize a coordinated, statewide effort to collect donations for victims of the earthquake and tsunami that devastated Japan. HONOLULU – Hawaii business leaders, members of the Japanese American community, Lt. Governor Brian Schatz and Japan Consul General Yoshihiko Kamo convened to organize a coordinated, statewide effort to collect donations for victims of the earthquake and tsunami that devastated Japan. Lt. Governor Schatz, who was asked by Governor Neil Abercrombie to help coordinate Japan relief efforts, also consulted all four county mayors by telephone. Hawaii’s largest banking institutions, including American Savings Bank, Bank of Hawaii, Central Pacific Bank, Finance Factors, First Hawaiian Bank, Hawaii National Bank, HomeStreet Bank, Pacific Rim Bank, and Territorial Savings Bank, have all agreed to serve as collection points for monetary donations. This coordinated, statewide effort, entitled “Aloha for Japan,” builds upon programs already initiated by individual banks to accept donations. This is the first of many initiatives being launched by the Aloha for Japan committee. Musical concerts and TV programs are also being developed. Donation checks can also be mailed to: Aloha for Japan, 2454 South Beretania Street, Suite 201, Honolulu, HI 96826. The Aloha for Japan committee was inspired in part by the collaborative efforts of local designers who formed a joint venture, GRP (pronounced “group”) HOME Company. This group designed an “ALOHA” t-shirt, incorporating the rising sun, emblematic of the Japanese flag. These “ALOHA” t-shirts, which are already in high demand, can be purchased at the following stores: Hi-Life/Buti-Groove Hawaii, Fitted Hawaii, In4Mation, Aloha Army, and Barefoot League. All proceeds will go towards relief efforts in Japan. Some of the business and community leaders who are part of the Aloha for Japan committee are listed below. Please note that many other organizations and individuals throughout Hawaii continue to do their part in supporting and providing aid to disaster victims in Japan. While the list below continues to grow, this is certainly not an exhaustive list of people who have demonstrated aloha for Japan. 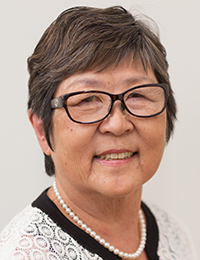 Constance Lau, Hawaiian Electric Industries, Inc.